It does look as though commercially available drones are set to be the next big thing, so do not be surprised if you were to find a particularly large box under the Christmas tree later this year, where upon unwrapping it, you would have discovered a drone that is simply waiting for you to fire it up and check out what exactly has the neighbor been up to all this while. Having said that, most of the drones or RC helicopters that we know of are rather fragile in nature, as in, they were not really cut out to be able to perform at a high level and continue working even after getting a few knocks and scratches about while doing their work. 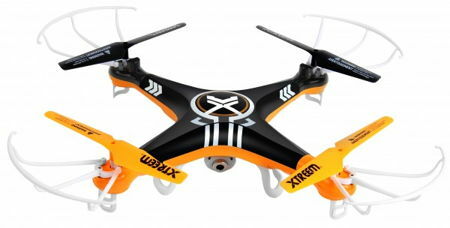 Swann Security has a very different idea, however, coming up with the Xtreem QuadForce Video Drone. The Xtreem QuadForce Video Drone would arrive in the form of a RC helicopter which will have an onboard color video camera right out of the box, now how about that? This is the very first product from the new Xtreem collection, allowing you to fly to new levels as the QuadForce will rely on the latest 2.4GHz frequency in order to have it enjoy a strong signal indoors or outdoors. Those who are interested will be able to pick up the QuadForce from Fry’s stores nationwide for $89.99. With the Xtreem QuadForce Video Drone, it was specially designed in order for it to fly in any direction, thanks to its 4-axis and lightweight and yet durable construction. The Drone’s 2.4GHz frequency would give you the freedom to have it fly up to 330ft/ 100m for a unique 360-degree flying experience, ensuring that the next level of evolution is achieved where RC helicopters are concerned, at the same time making all of the other models in the past look really old and outdated. All recorded videos using the onboard color video camera will be stashed away on a microSD memory card, and you can record 720p HD color resolution videos or images with it. The remote control is powered by a quartet of AA batteries, where 50 minutes of USB charging of the Xtreem QuadForce Video Drone will result in 8 minutes of aerial flying time.